Happy Monday babes! As most of you know, thanks to a conference I attended, I got to spend some time playing tourist in my own city last week and part of that was getting to explore parts of Disney property that we don't normally check out. Disney's BoardWalk has plenty to do but is often ignored if you aren't staying on Disney property. Reminiscent of Coney Island, the boardwalk has restaurants, games, bars and dance halls, shops as well as a hotel. 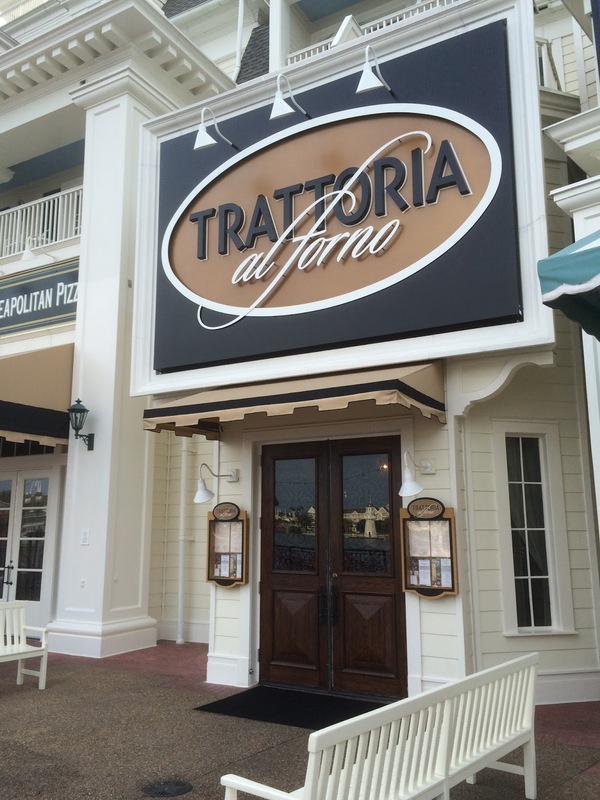 We got to check out one of the newer restaurants, Trattoria al Forno. 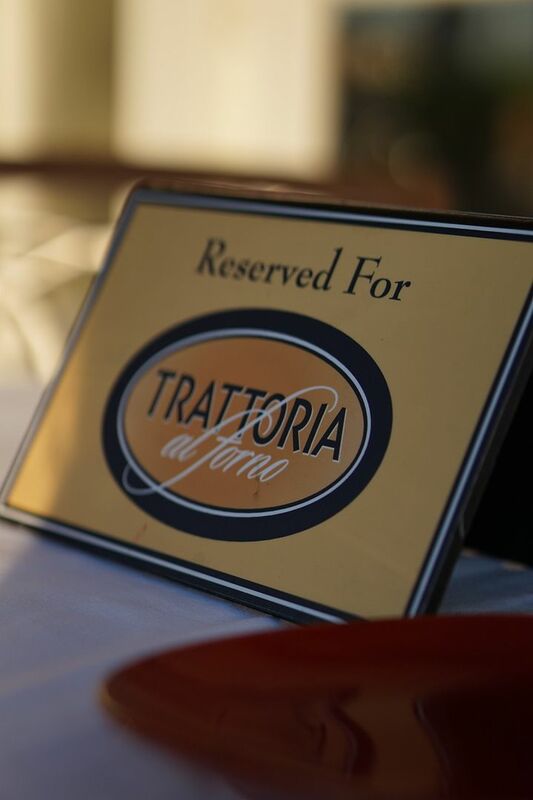 Even though Trattoria al Forno isn't in the "heart" of all the action, I would still recommend to have a reservation to eat there or be prepared to wait an hour or more. There is a walk-up window outside where you can order pizza by the slice or a whole pizza to go but all the seating on the patio is for dine-in guests so you'll need to take it with you and find somewhere to eat. If you're dining in, you'll notice they have an extensive wine list as well as beer and cocktails. You start your experience with a warm, freshly baked ciabatta loaf with olive oil and if you know me, you know the way to my heart (at least at a restaurant) is delicious fresh baked bread. Everything at Trattoria al Forno is made fresh in house from the bread to the pasta, the only thing that is brought in is the gelato and that's due to lack of freezer space. 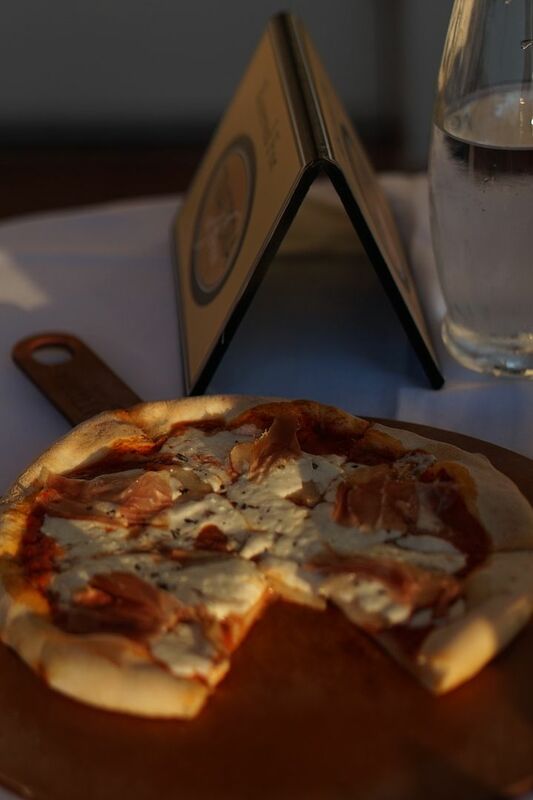 We opted for the smoked prosciutto, potato, rosemary and mozzarella pizza and it did not disappoint! The pizzas are relatively small so if you're sharing I recommend getting either an appetizer or desert to make sure you don't leave hungry. I was craving funnel cake (which happens to be located in a stand across the street) so I opted for the Zeppoli for desert and it was AMAZING. I could have easily asked for the strawberry balsamic dipping sauce to go and eaten it with just a spoon and been completely happy. So, if you're ever at Disney and want to check out some "old-fashioned" charm, head over to Disney's BoardWalk! And there's still time to enter the Gucci giveaway! Live Love & Read | Fashionomics | My Style Diaries | Side Smile Style The giveaway is open internationally! The more “tasks” you complete below, the more entries you will receive, increasing your chances of winning! a Rafflecopter giveaway You are sure to discover some amazing bloggers you may not already be following! Good luck! Looks amazing with that dress! What an adorable dress! Looks so springy and pretty!! Have a wonderful week! This place is one of my favorites - we eat there everything we head to Disney! I love the Boardwalk! It really is overlooked if you aren't staying close by. I will have to try out this cute place next time we are there! Yep - the way to this girl's heart at a restaurant is fresh baked bread, too! There's nothing better. Happy Monday! 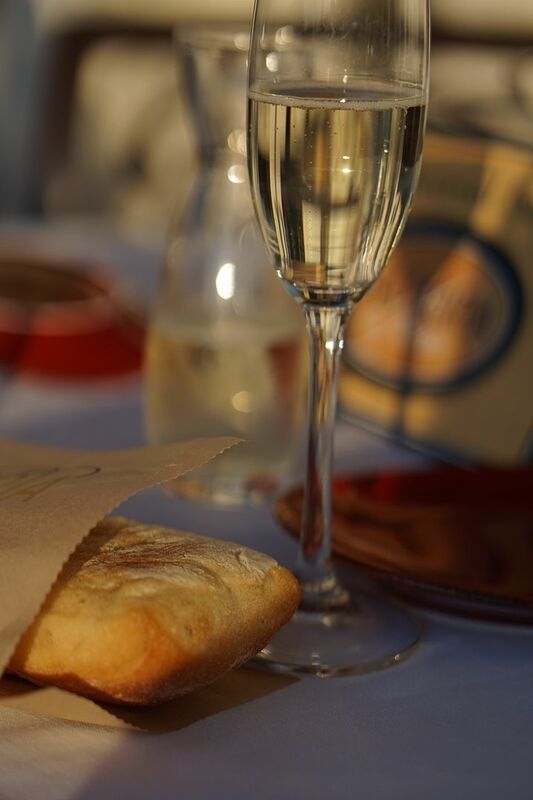 You had me at bread and olive oil - it's the way to my heart, too! Have a great Monday! That dress looks SO gorgeous on you! I love the floral print! Happy Monday girly! Love the boardwalk! We usually stay in one of the hotels near there but aren't this time for the first time. We got pizza take out from there and it was so good! ah i just love that outfit on you. so boho cute. and that restaurant is def yummy. been ages since i've been there. the boardwalk is super fun! happy monday love! It's always fun to play tourist in your own city! This restaurant sounds incredible -- a pizza with potatoes and rosemary? I'm in!! Love that everything is made fresh and in house, too. Happy Monday! What a cute little restaurant! The pizza looks delish and you look amazing in that dress! Hope you have a great week, friend! Ryan and I went here when we were visiting a few weeks back - the food was so delicious! The Boardwalk is one of my favorite parts of Disney - I hadn't been there since I was younger, and it seriously hasn't changed one bit. Well I wasn't craving pizza until I started reading your post! Trattoria al Forno sounds like the perfect place to relax after a long day in a Disney park. I could also really go for some of that gelatto that you talked about as well! Woah what a great giveaway!! Thanks for co-hosting! All of that Italian food looks sooo good right now (especially since I haven't had lunch yet). ooh love this dress! gorgeous on you. i will have to remember this restaurant if we ever head back to Disney - that pizza looks and sounds delish. Love this dress, so pretty! I have not been to disney in over 20 years, I need to go! That pizza looks divine. That pizza looks so good and loving this perfect Spring outfit! This looks like such a great place...I want that pizza! :) Also your outfit is so cute! I'm loving the beautiful dress paired with those stylish wedges! Disney's boardwalk is such a beautiful little strip to explore on a nice day! 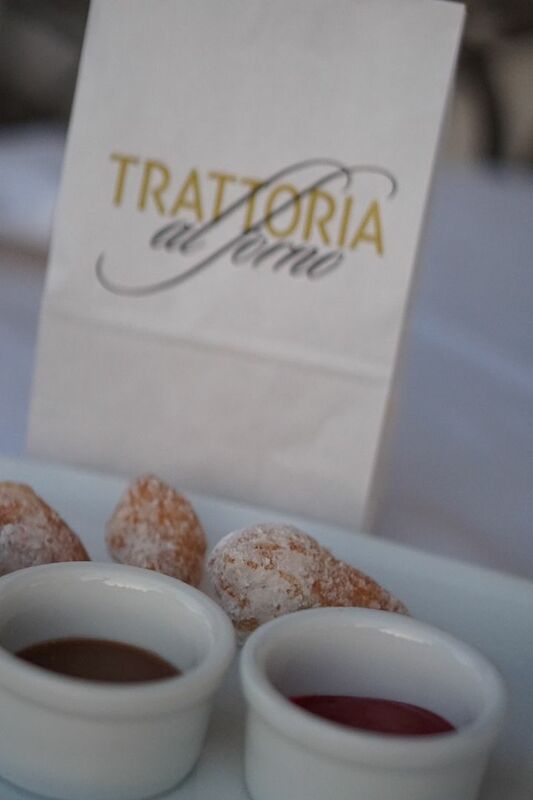 I've been there several times but haven't tried Trattoria Al Forno. The restaurants seem to change over the years. Gorgeous outfit for a cool spring day! What an awesome little restaurant- the pizza looks delicious and I love a good dessert menu! Mmmm all of this yummy food! That dress is beautiful on you! I'm such a pizza fiend- love this! And your super cute boho outfit! Fresh bread is the way to my heart too. Yum! Loving your dress.